Thanks for visiting! 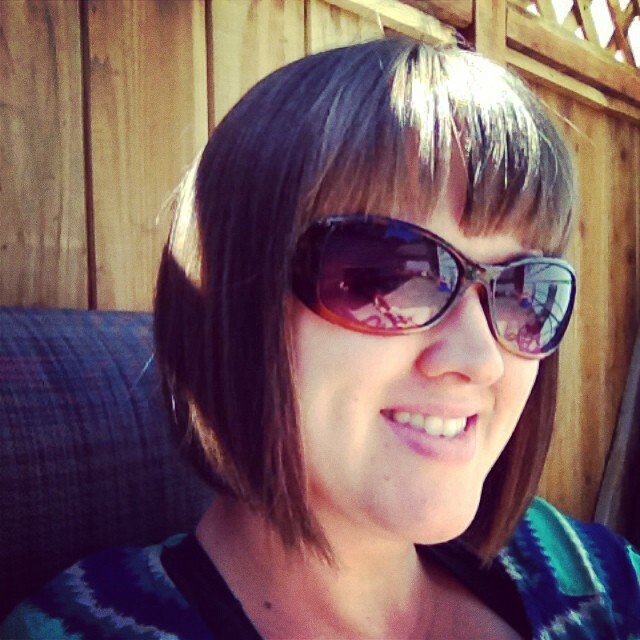 This post was written before I adopted an intuitive eating/anti-diet approach to eating. However, he idea of eating from one bowl still intrigues me, and it must also intrigue others as it continues to be my most visited blog post! I no longer write here at YogawithsShawnee.com. However, I recently started a new blog called Sunday Morning Yoga at www.sundaymorningyoga.com. I’m considering a regular One-Bowl featured post in the future. Please hop on over to my new blog and give me a like and a follow so you don’t miss out when it happens. For now, enjoy The One-Bowl method. You know when you have one of those profound ideas – one of those ideas in which you are absolutely certain nobody else but you, in the history of humanity, could have possibly dreamed up. I had one of those thoughts recently. This idea that I should just eat like a monk kept circulating in my mind. I had no idea what it meant. I just had this picture of a monk sitting in silence, getting his one bowl filled with food, expecting nothing else and being totally content. I thought, that’s a perfect a book or cook book. I’m gonna do it. I’m gonna eat like a monk. So I googled it. Turns out there are countless articles about how eating like a monk is very beneficial to your health and can reduce weight, heart disease and cancer. There was also a book written in the 70s called “One Bowl” and there are a few cookbooks based off of a monk-inspired three bowl eating. After letting the disappointment that I did not in fact have a totally unique idea soak in, I decided to investigate further. Turns out there is a Catholic Monastery where the monks use two bowls, and it is traditional of Buddhist monks to use three nesting bowls at each meal. 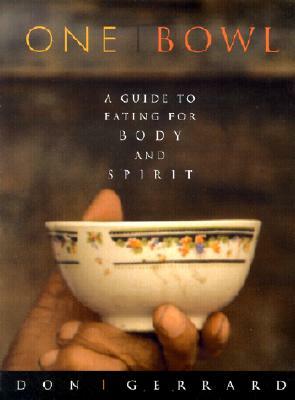 After checking out “One Bowl: A Guide to Eating for Body and Spirit” by Don Gerald from the library and reading through the first chapter, I discovered the idea of eating from just one bowl actually stems from Buddha himself. When he started his pilgrimage as Siddhartha, he took just one bowl with him and relied on others to fill up his bowl at each meal. I am guessing there were some meals where he went without. The goal of one bowl, two bowl or three bowl eating is to eat in a mindful, appreciative and quiet manner, helping you to become better attune to your body, to your food, to those who prepared your food and to the earth. It’s kind of a sweet practice. For the past three days I’ve been eating from just one bowl. I have a smaller two cup bowl and a larger bowl that I am designating for salads and less calorically dense food. Today I actually used two bowls for lunch. 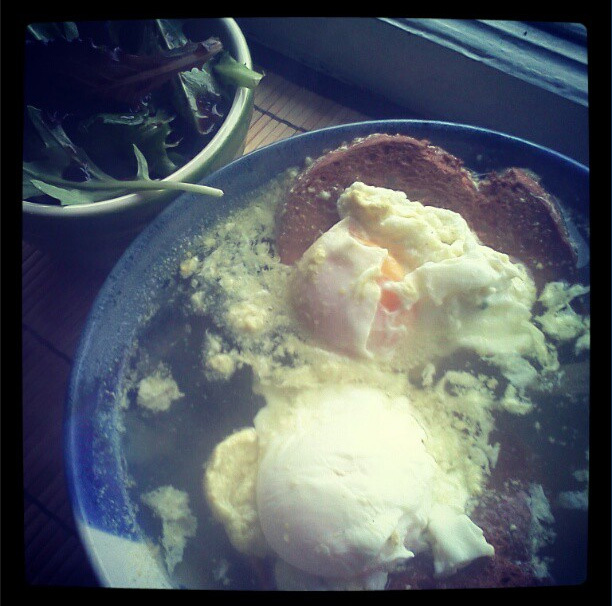 I had a small leafy salad in my small bowl and in my large bowl I had chicken bone broth with two small gluten free toast boats carrying two roughly poached eggs. It was beautiful , nutritious, and incredibly comforting on this rainy March day. And I did find myself more mindful of my food. I thought about the organic spring mix growing in rows; the chicken roaming on the farm; my mom gathering the eggs; and the bone broth I let simmer all day long. During the past few days I’ve been trying this idea, I’ve found myself drawn to nutritious foods. Since nutrition is very important to me, I want to fill my bowls with food that will be the most nourishing to my body and soul. As I continue this journey, you can follow my one bowl eating on Instagram. Additionally, I hope to share a few one bowl recipe ideas and a book review on my blog as well.